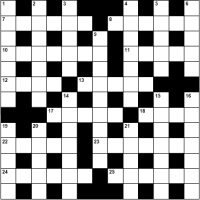 Clarity Media can now supply General Knowledge Crosswords in addition to our quick crossword and custom themed crosswords. General knowledge crosswords are ideal for those occasions when you have a specific audience in mind: perhaps those who enjoy pub quizzes and having to work the little grey cells a bit harder than may be required with the popular quick crossword that is so popular with a general audience. We supply our general knowledge crosswords in PDF or EPS format. Please Contact Us with your requirements, and we can take it from there. Please note that you should visit our Quick Crossword Puzzle page if you require standard quick crosswords and our Custom Crosswords page for those occasions on which you need a crossword on a specific topic.